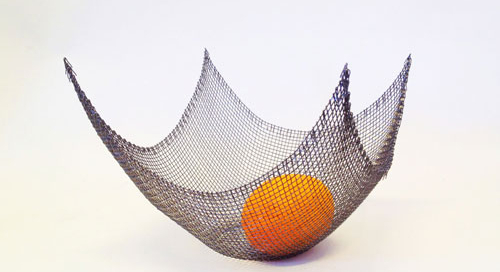 The esthetic of this steel mesh bowl is inspirered by pure mathematics. You can use it as a fuitbowl or as a decoration on your table. I made this sculpture to a friend who was pregnant. She wanted a reminder of her pregnancy. So I made this woman who is bearing a child. I think there is something very calm and secure about her, which suits my friend perfectly! This sculpture is a celebration to all a women out there. By highlighting this pice you can create interesting shadows. Collaboration between Johanna Forsberg & Stefan Markström, Olofsfors bruk. We did a series of works with my sculptures and his painting on them. They where exhibited in Stockholm, Vaxholm summer of 2013. The fashion industry is customary to say that horizontal stripes make the body look bigger. 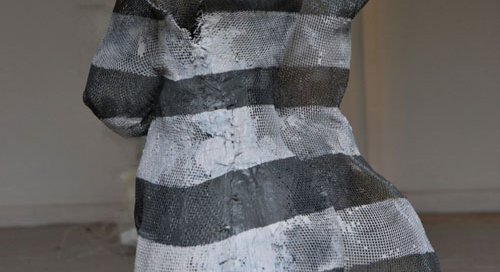 Often they add the stripes in the other direction so that the garment will get the woman look slimmer. But we did not think of it that way. We wanted to do a tribute to all the beautiful women out there, big or small. That is why the STIPRES are horizontal. Up here in northern Sweden we have a lot of beautiful birches, pines and firs. Waving in the wind, following natures every movement. Standing tall, strong. I marvel in their presence. 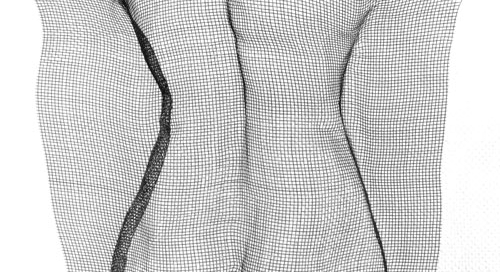 Fine lines grow out of the trunk, in perfection. All different and unique. A gentle twist, a sudden one. A back can tell many stories. Whats yours? This dinner table chandelier is made out of copper mesh and gives a delightful varm light to your interior. I thought of a burning cloud when I made this and I think the copper mesh comes to life when the retro lightbulb catches fire! The structures are made up of steel mesh bend into a soft curve inspired by the logic of pure mathematics. The mesh grid creates a mass of intricate shadows when lit. Also available in various colors, stainless steel and as a light holder with a flat bottom. 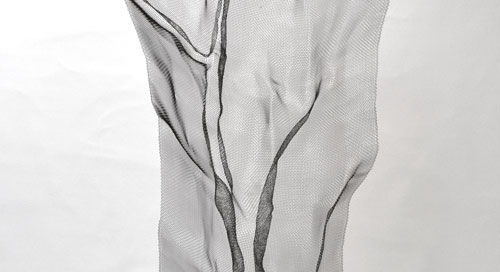 The translucent lines gives the mesh holder a weightless hovering. 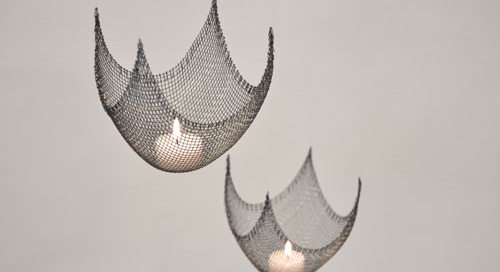 The PARABOLID mesh light is the perfect eye catcher in your home. The structures are made up of steel mesh bend into a soft curve inspired by the logic of pure mathematics. The mesh grid creates a mass of intricate shadows when lit. 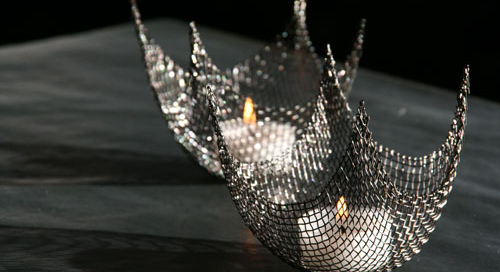 Also available in various colors, stainless steel and as a light holder with a flat bottom. The translucent lines gives the mesh holder a weightless hovering. 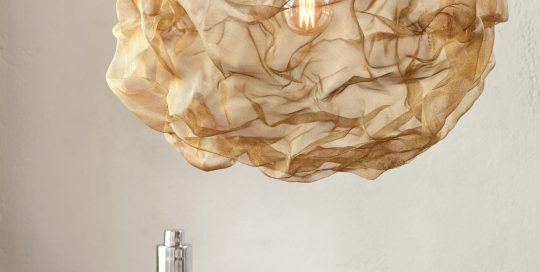 The PARABOLID light holder is the perfect eye catcher in your home. I tried to capture the innocence and fragile state of any man and woman with this sculpture. Life may have wounded us a bit, and some wounds may still hurt. But we are still standing strong.